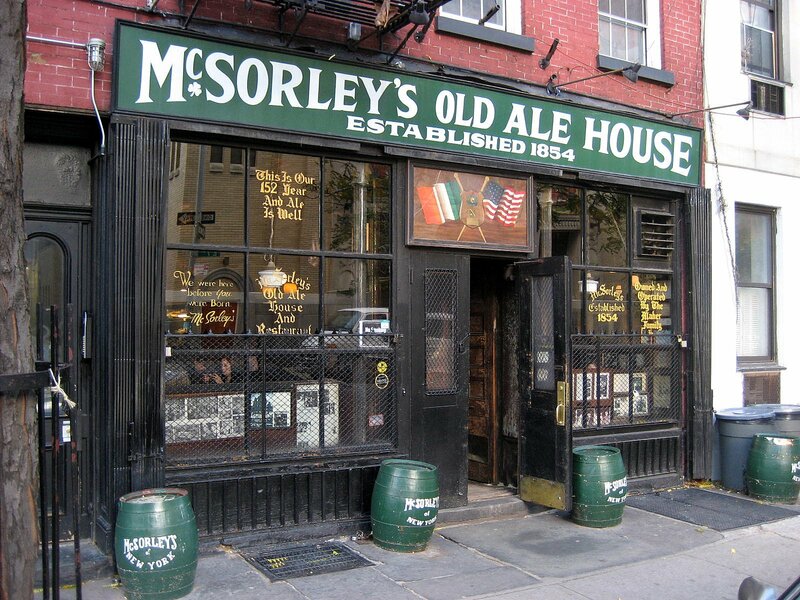 Revisiting McSorley’s Old Ale House | A Continuous Lean. As more and more of New York’s endearingly grimy dive bars are pushed out daily (R.I.P. Milady’s) to make room for whatever organic farm to table â€œbespoke ale experience,â€ is trending that month, the precious few hole-in-the-wall joints that we have left in this city must be treasured, least they end up out on the curb like a kicked keg. 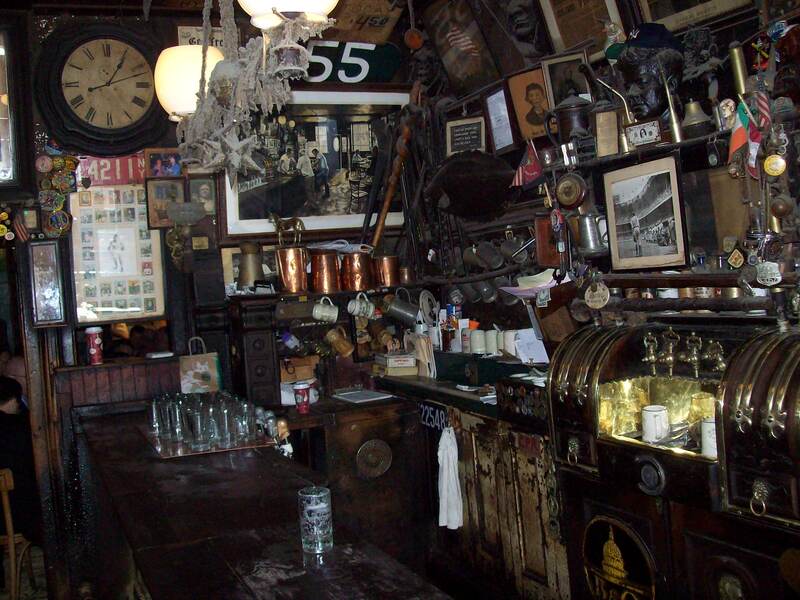 And no gritty saloon is more worthy of our admiration than McSorley’s, the self proclaimed â€œfirst Irish Tavernâ€ in New York City. With a tap list that includes just two options, a grimy straw floor, and an interior that hasn’t been altered since 1910, â€œMcSorley’s Old Ale Houseâ€ on 7th Street is where you go when you’ve had enough of the preening and pretension that runs rampant in downtown’s bar scene. â€œLightâ€ and â€œdarkâ€ are the only words you’ll need to know at McSorley’s, as their minute mugs are exclusively filled with the soapy suds of their two in-house brews. If you’re feeling bold, you can order up a gloppy Corned Beef sandwich or a hockey puck burger, but we recommend merely drinking down one of their beers (which by the way always come in pairs, as in order one get two) and admiring the bar’s unique decor. Houdini’s handcuffs are strapped to the bar, wishbones hang above your head, while portraits of great men like JFK and Alfred E. Neuman adorn the walls. McSorely’s is actually located on 7th STREET and not Avenue. You right. Slip of the tongue. Updated! Great article and a genuine tribute to one of the few real bars left in the City. 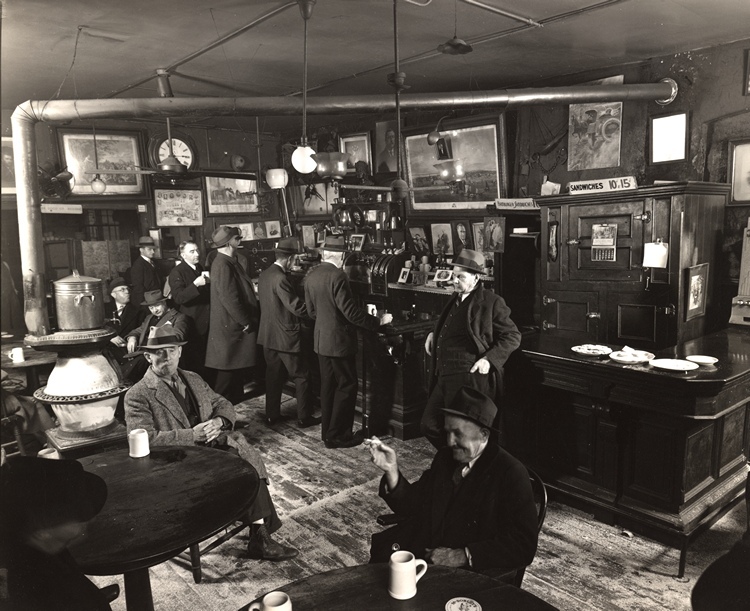 Don’t forget that McSorley’s is also the subject of one of the great essays on drinking and bars in American letters! …a sleeve of saltines, brick of cheddar, sliced white onion and the spiciest Coleman’s mustard known to man. Perfect. It’s no Edward Abbey as style icon, but it’s close. Incidentally, the cheese plate is the smart call for food there, if you don’t mind your breath smelling like onions the rest of the day. Great write up! JG – really enjoy your posts. McSorleys is a classic but if there was a list of survivors… I’d put Nancy Whiskey Pub at the top. Great spot in Tribeca that doesn’t disappoint. Haven’t been in years. Could go for 8 dark right now. I went to school at Cooper Union less than a block away and I always heard the wish bones hanging above the bar are from World War I. Apparently, the regulars at McSorley’s hung the wishbones before they went to fight overseas, and when they came back would take them down. The ones that remain are from the regulars who never made it back. God Bless this place. A true piece of old NY. Have had many a fun night with a few (many) dark brews. I love that New Yorker piece – such a great piece of writing. Probably won’t be back in New York any time soon but I’m determined to visit that place one day. Great post, thank you Michael. Used to go to lunch there when I worked manual labor in the neighborhood back in ’93. Ham and cheese sandwich, I think I recall. The local Ukrainian church is of course right across the street, and of course that used to be the old Ukrainian neighborhood, where my father grew up. The old Ukrainians like my grandfather used to go in there and drink with the old Irish. It’s things like that which remind you of how great NYC is .Yeah, yeah, gentrification, yuppification, yes, yes, yes — but still. Back in the 80s and 90s that place was always completely infested by hordes of the most obnoxious sorts of NYU frat boys; so I’ve always steered clear. Given that nowadays that there are so many more places for the frat types to infest, has McSorley’s become civilized again?